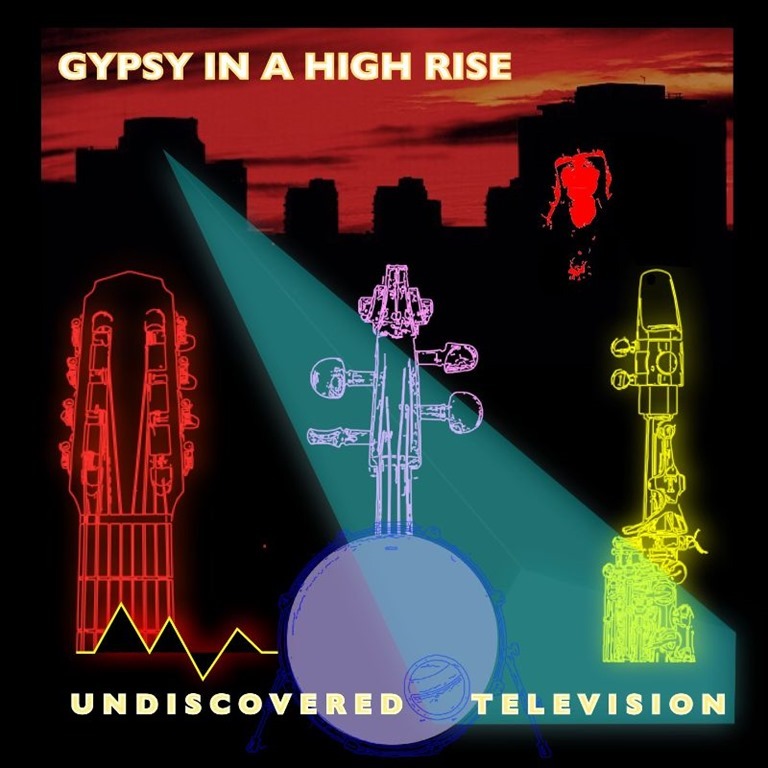 Undiscovered Television, or UTV, is a 4 piece band based in London, who formed in 2015 and now release their debut album Gypsy In A High Rise and their single Smedley Butler’s War . Andy says: “I wrote these 8 pieces to be part of a whole. Yes it’s a post jazz concept album. Rhythmically they span time signatures from 1 through to 11 and deliberately play with angular harmonic ideas to paint a picture of ethnic dislocation and regrouping, of the call of the big city and of dreams stolen in motorway service stations, overwhelmed by new forms and unfamiliar life patterns, and of having to find joy and humour in that”. UTV, consists of James Arben on soprano sax, Andy Lale on 8 string guitar, Martin Teshome playing cello and drums and percussion from Phil Clarke. These instruments have been chosen consciously and compositionally to compliment the full range of the cello and 8 string guitar, which has two bass notes pitched below the usual 6 string guitar. The overall effect is created to evoke unexpected voices through the triggering of samples and pads. Andy is attempting to recreate and build on the soundscape of a jazz quartet. Andy wanted to see how the cello and guitar might work together, trading bass lines, comparing the instruments ability to be chordal and to fully explore the instruments’ respective qualities for creating solos. Arben has recorded on BBC National Radio numerous times, been live on BBC TV, at lectures at BIMM London and at the Institute of Contemporary Music. James studied with Jazz Messenger Jean Toussaint, Bobby Lamb, Ralph Alessi and Bob Mintzer. Arben has performed at Glastonbury Festival in the UK and at other major festivals in Europe, Australia, South Africa, Japan and Brazil. He has played with many renowned musicians including The Heliocentrics, Molotov JukeBox, jazz funk soul band Down to the Bone, Mary Wilson of The Supremes, Tony Visconti, Maxi Priest, Digby Fairweather, Rufus Reid, Finn Peters and Finley Quaye. Martin Teshome is an eclectic cellist who is classically trained and experienced in jazz, Klezmer and Carnatic music. He was a member of a South Indian-Western classical fusion project Nada Notes, and is a member of the London Chamber Players. Martin has attended master classes with Frank London and has performed in the UK, Italy, Hungary and Germany and Japan. Phil Clark has worked with Royal Philharmonic conductor David Murphy composing pieces for Sinfonia Verdi, and studied with Bob Armstrong, John Taylor, Mark Roberts and Ralph Salmins. Phil plays live across the UK, and has recorded with Pete Doherty and his contemporary, the late Alan Wass, Mick Jones, Samuel Lane, John Fairhurst and many more and worked with producers U2’s Mark Wallis and Oasis’ Peter Dehavilland. The band’s biggest inspiration and influences include Pat Metheny, particularly The Way Up, Miles Davies, especially his cool jazz in the 1940s quintet Kind of Blue, Joe Zawinul and Third Stream, a musical genre midway between jazz and classical, termed by composer Gunther Schuller in 1957, The European free jazz movement with preference for John Stevens and Carla Bley. The debut album by Gypsy In A High Rise is 56 minutes of improvisation and composition, recorded to a high quality, which includes a solo by cellist Ben Davies, who has played with composer and improvisation trumpet player Laura Jurd and live saxophone by James Arben. UTV’s album Gypsy In A High Rise and single Smedley Butler’s War will be released on July 1st 2016. The album is produced by Andy Lale and engineered by Nicholas Oloffson at Kore Studios London and mastered by Mandy Parnel.